This article is about the substance in Yoshi's Story and New Super Mario Bros.. For the FP-healing item in the Paper Mario, see Jammin' Jelly. Yellow Yoshi looking up at some blue jelly embedded in the roof of a Jelly Pipe. Jelly is a substance that makes its first appearance in Yoshi's Story, specifically in stage 2-3, Jelly Pipe. 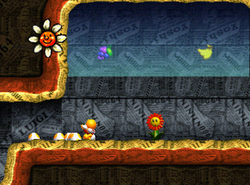 Here, it can be "dug" into by the Baby Yoshi using a forceful move such as the Ground Pound. Sometimes fruit is trapped in the jelly, also. The jelly in this game comes in blue, magenta, and cyan. Sometimes Jelly Ghosts hide in the jelly. Jelly (here called gelatin) also appears in World 7- in New Super Mario Bros. Here, it can be dug into with a Ground Pound once again in one room. In another room, it comes in "waves" towards Mario in a room filled with Splunkins. The jelly in this game only comes in green. ↑ Loe, Casey (2006). New Super Mario Bros. Official Nintendo Player's Guide. Page 91. This page was last edited on December 16, 2018, at 14:27.